Let us know how we are doing! 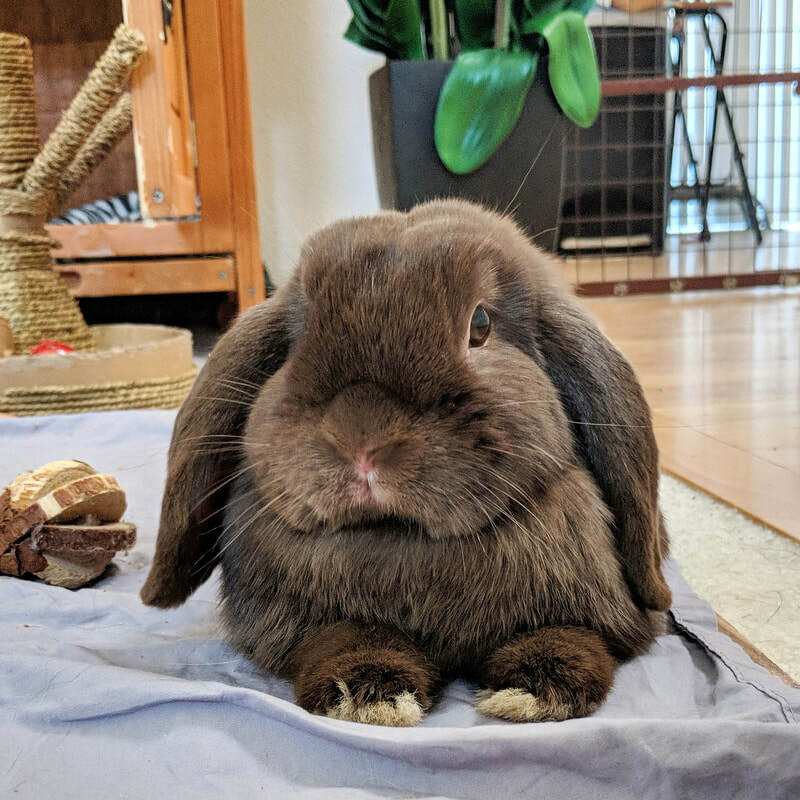 We would love to see pictures of your bunnies that came from us! Also if you have attended one of our events, we'd love to hear back from you! If you'd like to submit a review with pictures of your bunny/bunnies, email them to bluecloverrabbitry@hotmail.com to have them added to our website! 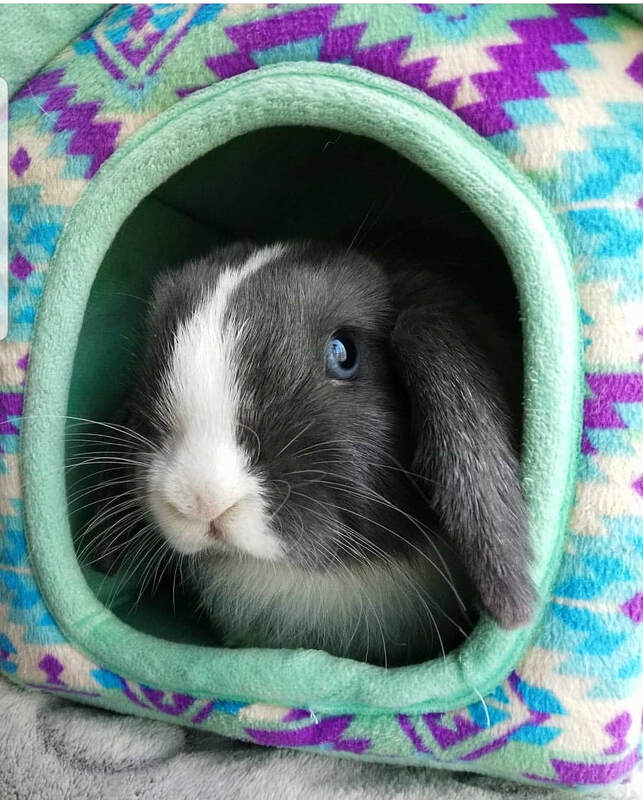 Just wanted to show a little update of bun. I decided to name her Bucket (a little weird I know) she is doing amazing. She grew so fast and continues to grow too fast, she’s so curious and energetic. She’s always so happy when I come home and she gets the happy bunny flops which are my personal favorite. She absolutely loves carrot tops it’s her favorite food right now. She’s just so perfect and snuggly, I couldnt have asked for a better new friend. Thank you for all the great work you did with her and with all you’re bunnies it truly makes a difference! Here a little picture of her!! 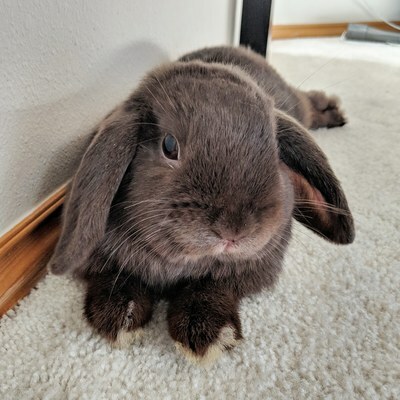 ​Easy and loving owners who breed beautiful baby bunnies and give them to homes who want to embrace their cuteness and loving characteristics. I love this rabbitry and this is the second time I’m getting a bunny from here. I’m from Maryland and this is the best rabbitry there is in the United States. The bunnies from Blue Clover Rabbitry are raised with such love and affection and it definitely shows! Our little Tom is so sweet and cuddly, but rambunctious and playful at the same time. We've continued him on the pellets and hay Adriana gives them and are also adding apple cider vinegar to his water...I love that Adriana goes the extra mile to give the bunnies the best possible start in life! Also, the lifetime support is invaluable! 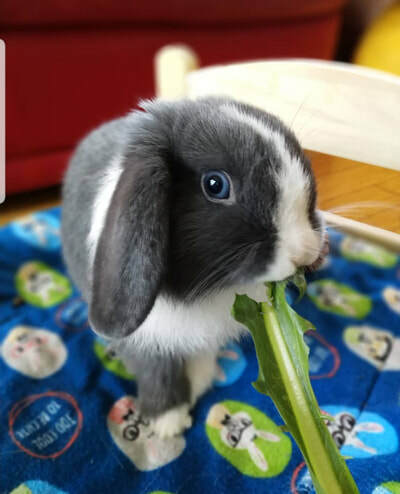 This little baby bunny that I got from Blue Clover Rabbitry is definitely the best bunny ever. He is sweet, very kind and very very mischievous. 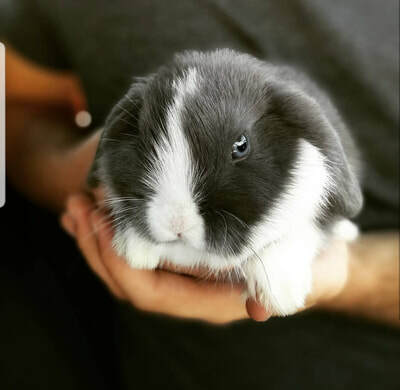 It's nice to have a bunny who is already used to being held and around other animals. He definitely likes to snuggle with my dog a lot. The shipping process was easy and Adriana was very helpful and answered all my questions on shipping, care and food. I love that she gives a little bit of apple cider vinegar to their water - that's so healthy!! I love him. "Adriana raises the sweetest little buns! She puts so much love into raising them and it shows! We got a little baby from her and absolutely adore her can't wait to get our other one in a few weeks. Highly recommended!" ​"We just got our 2nd bun from Blue Clover Rabbitry and are beyond happy with both our sweet beautiful little balls of cuteness!! 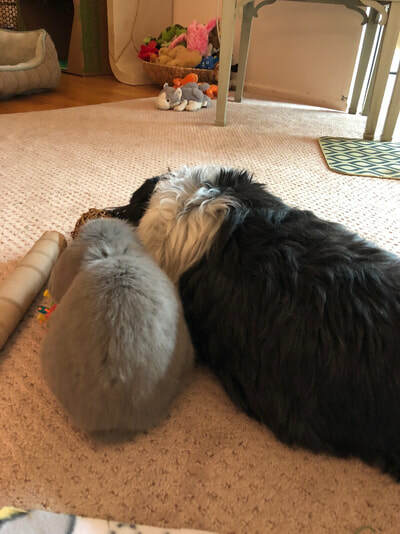 I truly can not say enough about Adriana and the time she spends with these buns and the love she gives them. I will for sure be back for a few more! I will only buy from here. 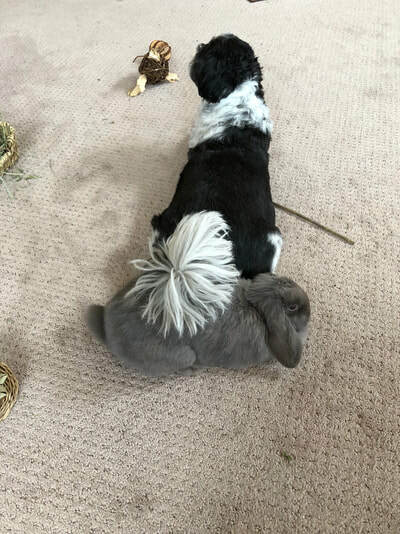 I am obsessed with your buns! 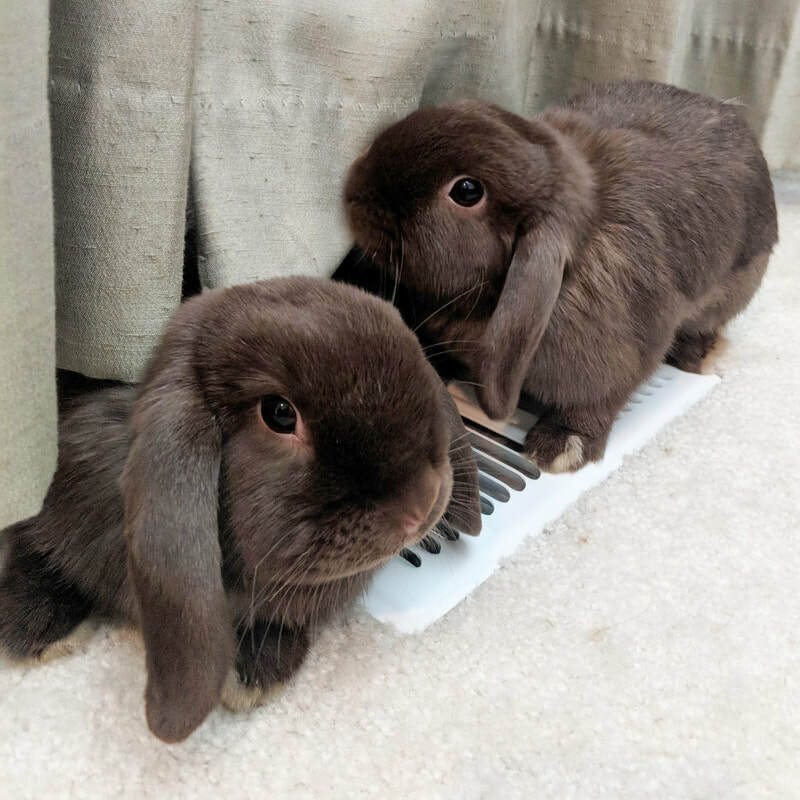 Thank you again so much for allowing us to see your adult and baby buns. I think we need 1 of every color now lol. You will be seeing us again SOON! Thank you so much for the 2 sweet loves of our lives!!! 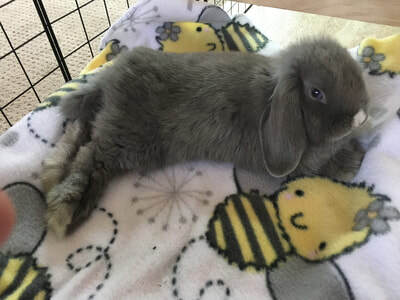 "
​"There are so many wonderful things I can say about Blue Clover Rabbitry. 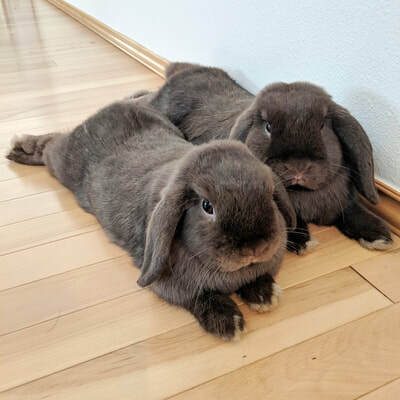 We got our girls Pumpkin and Butternut in Feb. of 2018 after following their litter on social media since their birth. 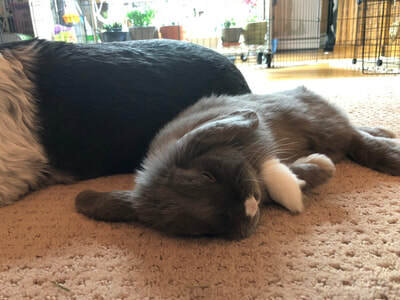 I knew I wanted bunnies from Blue Clover after watching how much they care for each one. They put a lot of effort into what they do and it shows in the temperament of the rabbit(s) you get. Our girls have been so sweet and well adjusted from day one. 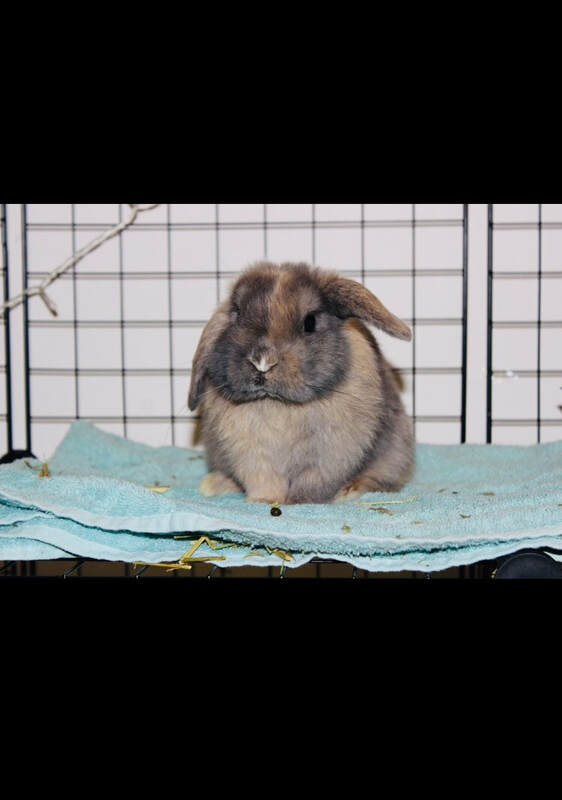 They are great around pets, they're calm in many situations that would frighten most rabbits and they do well with being cuddled and handled. We've been constantly surprised with how well they do with new things and we know it's because they had a good upbringing. I could not recommend Blue Clover more!" ​I don’t even know where to start. Blue Clover/Adriana is the most loving and supportive Bunny Rabbitry one would be lucky to find if looking for a special bunny. Each and every baby is loved, part of their family, socialized by two sweet, precious dogs, little children, elderly, etc. Adriana loves each and every bunny and the love that is shown to each baby makes her bunnies sweet as sugar. Believe it or not, I have a 9 year old precious, sweet Shih Tzu that was very lonely, has hip issues, etc and Adriana made sure Bailey spent extra time with Moxie. Moxie was flown to NY and she was caged beautifully and in pristine, clean condition!! 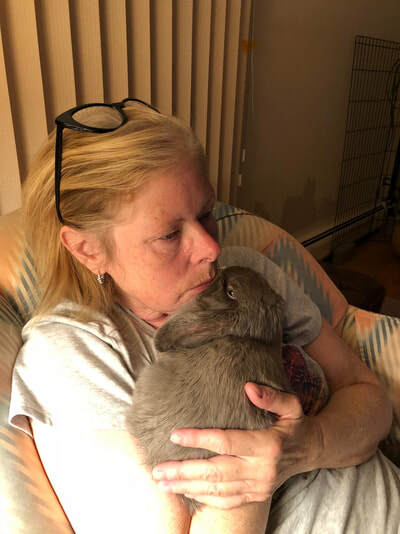 Typically people say bunnies don’t like to be held and rarely lick. My sweet Moxie only wants me to hold her and can’t give enough kisses. Adriana goes the extra mile. She is there for you even after you get your baby for support, advice, etc. She truly has become part of our family and I am forever grateful for her support, when I felt unsure of something, etc. She sticks with you. This is not a typical Rabbitry. This is a loving, caring family labor of love. In addition, Adriana’s merchandise and her pellets are amazing. 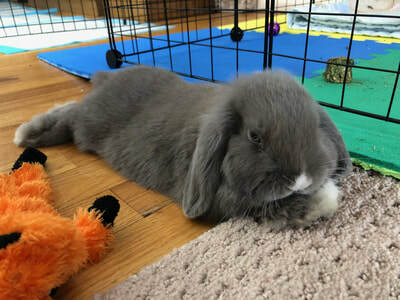 Those pellets make Moxie’s fur so soft and she loves them! 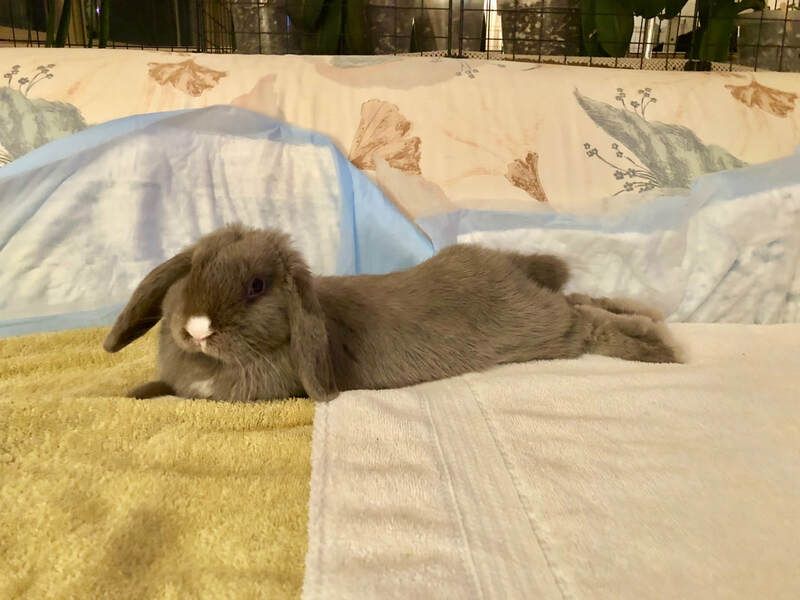 "Our new baby came from here - we are new to the bunny world and were helped every step of the way and every question answered. Lil Jump arrived safely and was already socialized and not a bit afraid of our kids or chocolate lab (thanks to previous exposure to Bailey the boxer!). 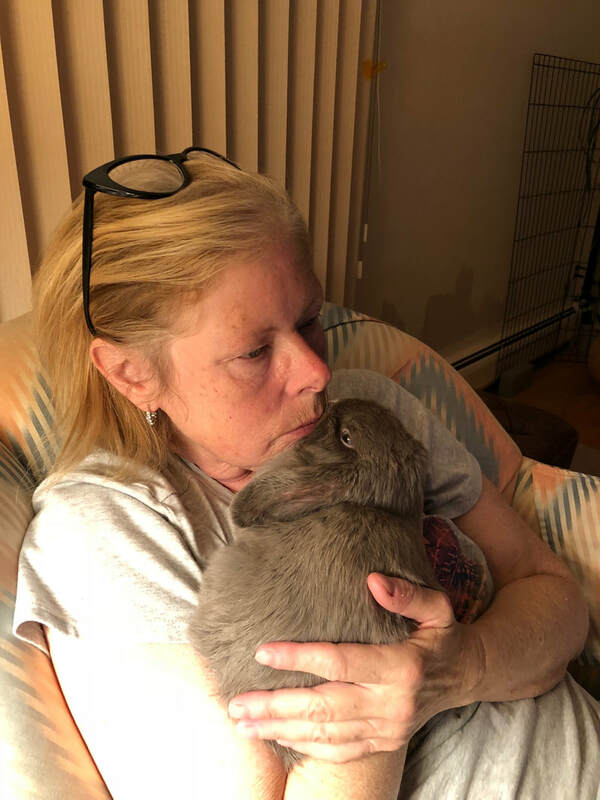 Thank you for raising great buns and for bringing such joy to our world!"